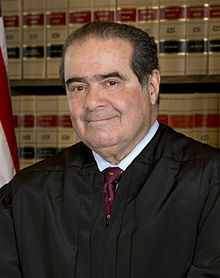 On February 13, 2016, Supreme Court Justice Antonin Scalia, a man of tremendous influence in the world, unexpectedly passed from it – into eternity. His son, Father Paul Scalia, a priest with the Diocese of Arlington (Virginia), celebrated his funeral Mass. Standing before Justice Scalia’s family, friends, and peers in the Basilica of the National Shrine of the Immaculate Conception in Washington, before a televised audience of the nation and the world, Father Scalia proved himself his father’s son. He did not choose to focus his sermon on his father’s impressive achievements. Instead he chose, as his father would have, to focus on Christ. Father Scalia spoke with Catholic Digest about “what God did for Dad” in commemoration of the one-year anniversary of his father’s death. Father Scalia, on behalf of my own family — and I’m sure many Catholic families — I want to tell you that when we heard about your father’s death, the first thing we did was drop everything and pray for his soul. Thank you; I appreciate that. It wasn’t always easy having a father who was a public figure, but it was the great consolation at the time of his death that there were all these Catholics around the country and around the world who did just pray for him spontaneously and immediately. That was a great blessing. You spoke of your parents’ happy 55 years of marriage. How is your mother doing? She’s doing OK as these things go. It’s a process. It’s a long journey. There’s a lot of support. She has nine kids and many friends. What stands out to you about your parents’ marriage? I think the simplicity and the generosity of it — the simplicity of commitment. They came from a time [that] when two Catholics got married, they knew what it was about; they knew it was for life. The importance of the Church’s teachings on all these things — I don’t think is present in a lot of marriages now. There’s the thought that somehow you can get out of this. [But there was] the simplicity of that devotion to their vocation and the generosity — [they had] nine kids. How did that generosity play out in everyday life? In a big family that generosity is going to be called out from everybody because you have to share things. As some of my siblings commented at the memorial a month later, we didn’t always have a lot of money. My mom liked to quip that my dad was always looking for a job that paid less than the one he had. I remember that when we lived in Chicago it was seven or eight kids living on a professor’s salary. That stretched us. There’s a generosity there. There’s a matter of faith there, doing these things, not limiting life, not searching for the big-paying job. There’s a trust there. They came from a simpler time and that’s just what you do. Again their faith was so central to their relationship in their married life. When you spoke at your father’s funeral, you said that your parents gave you one another. Tell me about that support. Bishop Alexander Salazar once said the home was the first seminary. What did your dad’s formation mean for your priesthood? It wasn’t just him, but of course my dad and my mom together. That’s what children need. That’s how the family is structured. My dad had a very strong conviction about the truth of Catholic teaching. It was that, that he gave me. I think also confirming us in an identity. What children do not want an identity? To know who we are and where we come from and where we’re going. Just the conviction of the Catholic faith that my dad had, established us in that identity: We’re Catholics. We’re not like everybody else, and we shouldn’t expect to do the things everybody else does. My dad, also in the dark days of the 70s and into the 80s, would travel to find us a church that was solid in its teaching and in its liturgy, because in those days there was a lot of crazy stuff going on. We joke that when we lived in Chicago, our dad drove us a half hour to go to a church that was 45 minutes away. That was a commitment. In 2008, I was assigned to our home parish as a pastor, and we had the traditional Latin Mass there in the extraordinary form, and my dad started coming there. That was a great blessing because together we got to appreciate the beauty of the Church’s tradition and liturgy. Tell me more about your dad’s personality. Former President Bill Clinton said that even though he disagreed with Justice Scalia, he liked him because he never pretended to be somebody he wasn’t. That’s right — and that’s probably the first thing I’ve ever heard from Bill Clinton that I agree with. I think that’s why my dad got along with so many people. They knew who he was. He wasn’t one thing today and another thing tomorrow as so many people, especially in D.C., are. Some of that had to do with his faith, and some of it was his temperament — who he was. Because he was God’s first. Did your dad take St. Thomas More — a lawyer, a judge, the top man after the king, as his special patron saint? He had a great devotion to St. Thomas More. Absolutely. He quipped that when the Vatican named St. Thomas More, who was the patron saint of lawyers for years, to be the patron saint of politicians, that it wasn’t a promotion. I think my parents saw the play, A Man for All Seasons when they were traveling Europe after their wedding. Paul Scofield would have been acting in it. He certainly had a great admiration and devotion to St. Thomas More — the integrity of the man, the legal acumen, his devotion. Did your dad also wear a hair shirt like St. Thomas More?I’m not going to reveal his mortifications. He had nine children; that was mortification enough. My dad is of course drawing that from the Apostle, St. Paul: “We are fools for Christ’s sake” (1 Corinthians 4:10). There has to be a willingness for a Catholic in the public square to look ridiculous. It was one of the things my dad liked to point out about St. Thomas More. We don’t really appreciate St. Thomas More unless we appreciate that he looked ridiculous. Everybody else, all of his peers, had gone along with the king. All but one of the bishops in England had gone along with the king. So he looked absurd. He looked like a fool. This is a theme from the witness of saints in general.Our Lord himself was ridiculed. So why should we think ourselves better than he? It was one of my father’s favorite speeches to give. He contrasted that with Thomas Jefferson — a tale of two Thomases. Thomas Jefferson, who famously cut up the Bible, crafted his own bible by cutting out all the miracles because, of course, those, according to the man of worldly wisdom, aren’t possible so you can’t have them. So you get rid of them. He thought the Bible was unsophisticated. Jesus’ contemporaries thought he was unsophisticated too. What’s he spitting and putting mud on that man’s eyes for? There’s a clip on YouTube of Stephen Colbert making fun of him at the 2006 White House Correspondents’ Association Dinner. Your dad thought it was hilarious. Did he like to laugh at himself? Absolutely. Those who knew him knew that the best way to get on his good side was to tease him right back. Was that the secret to his friendship with Justice Ruth Bader Ginsburg? I think that must have been part of it. But I think it’s that he was who he was and she is who she is. There wasn’t any pretension. He could respect her. He could disagree with her, but she was consistent. Even though there was disagreement, there was respect for the integrity of her thought and word and who she was. I think a lot of that was his upbringing in New York. New York City, especially in the 40s and 50s, is just this place where everything is going on. You’ve got all sorts of people. You can’t live in a bubble. You have to learn how to get along with everyone. Unless you want life to be miserable, there has to be an appreciation for the differences among people. In your homily at your dad’s funeral, among other things, you talked about praying for the dead, not robbing them of your prayers by assuming they are in heaven. That sounds like your dad. My dad hated the word homily. He thought it smacked of modernism. He would prefer sermon. A point I always make when I do a funeral is: This is how we can continue to do good for the person that we love. It takes a supernatural sense in order to grasp that. Everyone wants to think everything is OK. Everyone wants to get to the happy ending without the struggle. You also talked about how thin the veil is between time and eternity and the call to repentance. What was the response to that? Thanks be to God and Our Lady that he has used it for good. Maybe it’s as simple as that his death brought people to focus on eternal things that they don’t typically focus on at all. Many people asked, why did Justice Scalia die at this point in the nation’s history when it seems that we really, really need him here? My dad loved that line! He loved it. That’s where I first heard it. He attributed it to Charles de Gaulle, so he would do it in a French accent. Oh my gosh, yes. He acted when he was younger. He was a ham. He could tell a joke. He could tell a story. Looking back over this year, what about him do you hope people will remember? His Catholicism was who he was. He lived life to the full. He had a variety of interests and friends, but the common thread would be three strands: He’s a Catholic; he’s a husband and father; he’s an American. Those were the most important things to him. Read an interview with the Little Sisters of the Poor here.